According to Price, Waterhouse, Cooper’s (PwC) 17th Annual Global CEO Survey, engineering and construction CEOs worry about raw material prices, capital markets and getting access to the right skills at the right price, but overall they’re still much more optimistic this year. That may be due to optimism over growth markets and the positive impact they expect to see from technological advances. 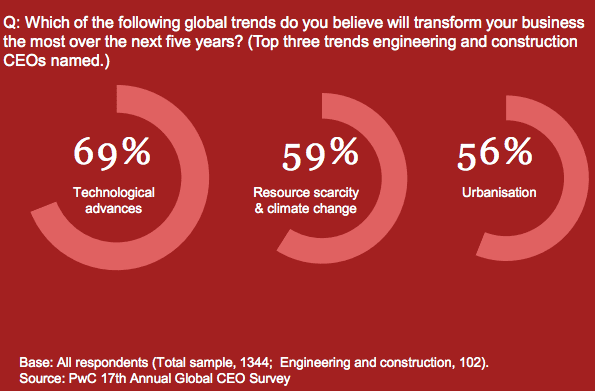 Engineering and construction CEOs have a much more positive outlook this year. 41% expect to grow over the next 12 months, up 10 percentage points from last year. That’s due in part to renewed confidence in the global economy, which 50% now expect to improve over the next 12 months, up from just 11% last year. But strong growth in new markets is a big part of the equation too – 26% see new geographic markets as the main opportunity to grow their business, almost as many as are counting on an increased share of existing markets. Where are they looking? 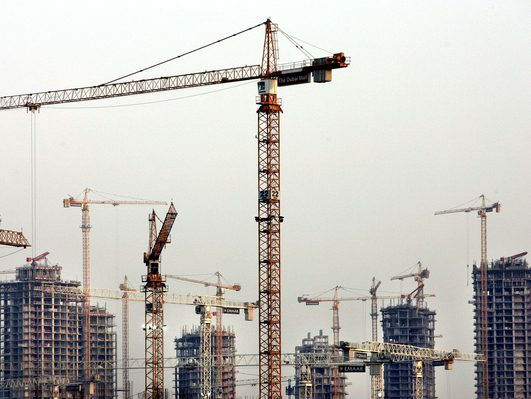 More engineering and construction CEOs (12% vs. 1% of CEOs overall) rank Qatar as one of their most important growth markets over the next 3-5 years, presumably driven by the 2022 World Cup and other infrastructure. And more (14% vs. 5% overall) rank “other Africa” as a top growth market too. That puts it on a par with China for the sector – only the US and Germany are rated higher. When it comes to transactions, 23% of engineering and construction CEOs who say they’re planning M&A activity, a joint venture or a strategic alliance are looking to Africa in the next 12 months, right after Latin America, with 25%. More sector CEOs (76%, vs. just 55% of CEOs overall) are concerned about high and volatile raw material prices. And the workforce is a matter of some concern too. Nearly one-third of sector CEOs are extremely concerned about access to key skills. And 70% worry about rising labour costs in high growth markets. So it’s surprising that a quarter of CEOs still see no need to change their talent strategies in response to transformative global trends. Like their peers across the sample, engineering and construction CEOs see technological advances as the top trend which will transform their business. Many called some aspect of technology the “next big thing” to impact their business, citing everything from new applications for formwork to techniques to better manage and utilise data. Most engineering and construction CEOs are optimistic about their ability to keep up–only 33% are concerned about the speed of technological change, compared to 47% overall. Sector CEOs rate both trends more highly than do their peers across the overall sample. To respond, CEOs see a need for change across a wide range of business functions. And they’re more confident that some functions, like IT and risk management, are well-prepared to cope. But there’s a big gap between aspiration and action. Less than a third say their company has already begun or completed a change programme in every area. For example, although 89% believe change in customer growth and retention strategies will be needed, just 21% already have programmes underway or completed, compared to 34% of CEOs overall. Similarly, 85% see a need to alter technology investments but only 25% are already doing so, compared to 35% of CEOs overall. Two-thirds of engineering and construction CEOs are concerned that bribery and corruption could slow down growth. Indeed, one-third are extremely concerned, compared to less than a quarter of CEOs overall.